Is it better to err unwittingly or to be all crouching pedant, hidden snoot? This is perhaps a question more of lifestyle than writing style, but one I nevertheless contemplated throughout the happy week I spent surfing the pages of Steven Pinker‘s new writing guide, The Sense of Style. He offers no easy answers — sometimes it’s definitely better to put your foot down; sometimes you’ll end up with egg on your face — but, having read it, I go back out into the world with a renewed sense of purpose and a better-calibrated sonar for the faux pas. Like Pinker, I’ve been known to dip into style manuals for pleasure. I pride myself on being pretty good at spelling, punctuation, and grammar (although I’ve stopped putting that on my dating profile — it turns me off, let alone potential candidates). But with great power comes great responsibility. You can crush someone with a correction, however subtly administered. To point out an error in grammar or punctuation is, to me, no better than to tell someone they look rough today, or to ask them if they were always so hateful. Even when those who’re usually doing the snooting on my Facebook wall suffer a lapse, I hesitate. Lead me not into temptation, I think, as their sordid misusage reveals them in their true colors. There’s a time and a place, though. In official contexts — in books, on company websites, on road signs, in stores, on television, and in countless other places — it’s absolutely right to be picky. We may know what’s meant when we see a grocer’s apostrophe or when someone refers to a single phenomena. But it’s distracting; it takes more effort to read; it takes away from the reliability of a given text. 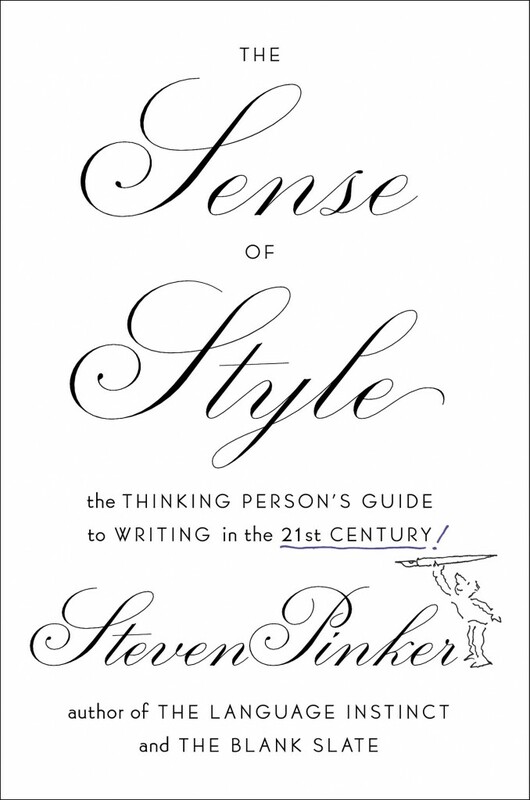 “I am a psycholinguist and a cognitive scientist,” writes Pinker, early on, “and what is style, after all, but the effective use of words to engage the human mind?” Good style effectively engages. And most writers, most of the time, wish to be understood straightforwardly and forthwith. But they don’t always succeed. At many points in The Sense of Style, Pinker is able to point to empirical research that demonstrates the retarding effect of poor lexical and syntactical choices. He might, for instance, comment on my use in that last sentence of “retarding”, which, though not incorrect, will distract the politically sensitive reader. He might also pick me up on “though not incorrect”, for the additional mental exertion required to unpick the double negative. And if you come to doubt my style twice in two sentences, you might also reasonably doubt the thought process behind it. But it’s not just at this granular level (did you cringe when you read granular? corporate-speak alert) that Pinker excels. The Sense of Style is a book you’ll end up wanting to thrust on your colleagues, to prescribe as set texts for all who enter any job which requires them to write. This isn’t just for the last chapter — a goldmine of usage advice — but also for the exceptional early chapters. In these, he sets out the benefits of classic style, how to avoid “the curse of knowledge”, the dangers awaiting the inadequate syntactician, and methods for ensuring coherence in your writing. What disease is that? The curse of knowledge,” he writes thirty pages later, “is the single best explanation I know of why good people write bad prose.” The problem is, you know so much that you can’t adequately express yourself. You end up writing a series of non-sequiturs, logical in their progression only to you. You tell the school party visiting your office that you’re late to speak to them because an OCM meeting overran and the CG kept you back. They won’t know what you’re talking about. Combat this curse, though, plus your terrible syntax, and all you have to do then is to make glorious, revelatory sense over the course of whatever it is you’re writing. Simple. But he’s only human. Like Kingsley Amis, who, in The King’s English, was quick to label certain usages “wanker-detectors” (“liqueur. Lih-CURE. Any attempt to say lee-cur in a Frenchified way is a useful wanker-detector”), Pinker has limits to his tolerance. On the abuse “irony” receives as a pseudosynonym for “inconvenient” or “unfortunate”, he quotes The Princess Bride: “You keep using that word. I do not think it means what you think it means.” I also whooped for joy to read Pinker’s call for civil disobedience in the case of punctuation inserted within quotation marks even when it’s not part of the quotation. I have adopted this nonviolent resistance throughout this review, and will continue to do so as long as I have breath to fight. The Sense of Style is a liberating read. A little knowledge can be very empowering, and to read a style guide as well researched and thoroughly argued as this can have an emancipatory effect on the careful writer. Ignore stultifying rules. Choose life. Discover your true sixth sense. Steven Pinker will appear at our next Seriously Entertaining show, Summertime Blues, on June 15 at City Winery NYC. You can buy tickets here.